The great enigma of this book is the twin of the title. We never get to meet Henk in any real sense: he dies before the story begins and what we learn about him is all second hand and unashamedly biased. For Helmer, the book's narrator, he was his other half - his twin brother with whom he shared everything: his thoughts and fears; his violent father; his warm childhood bed and his home in rural Holland. A fatal car crash ripes the twins apart and the book depicts a family in mourning following the death of a loved-one. It begins some twenty years after Henrk's death, but Helmer and his father are in a world where time stands still; each one aching for the missing person in their lives and mad as hell about it. The father, old Mr Van Wonderan, is an elderly farmer and relies on his remainling son, Helmer, to see to his every need. But that is just it, Helmer does not see to his needs, but instead in a horrible power-play, he delights in neglecting his aged parent at every possible opportunity. When Mr Van Wonderan says he is thirsty, Helmer says that he gets thirsty too, and leaves his father longing for a drink for hours. This is how Helmer repays his father for ill-treating him as a boy and for forcing him to give-up his dreams of a different life. Helmer longs to travel and to explore, but he is weighed-down by responsibilities of the farm and by his anger and grief at the loss of his twin brother. It is only when a strange young boy, also called Helmer, comes to stay on the farm, that things begin to change. Suddenly Helmer is brought face to face with someone who needs him; someone who forces Helmer to realise that life is not to be wasted; that he loved his brother, lost that love, but must move on. The change is presipitated by a near death experience after an accident on the farm and when Helmer is given the kiss of life by young Henk. With this 'kiss', he is 'reborn' and begins to slowly come back to life. While this book deals specifically about being a twin, it also deals with the feelings of loneliness that we all feel, as we move through life, loose loved-ones and try to find our own place in the world. And while all this sounds very depressing, it is true to say that there is much that is compelling and life-affirming about this beautiful book. There is a quietness about it that is perfectly in keeping with the landscape of Holland. The dykes, low-lying ground and windmills are wonderfully described; the simplistic language of the text perfectly suiting the sparse physical landscape. This is an introspective novel, where the narrator bears his soul to the world. This creates a very personal tale, yet it is a universal one too. It deals with every emotion associated with sudden death; loss rejection, abandonment and the anger of being left behind. Yet, on one level, the twin of the title is a metaphor for the 'other' that we all search for in life, the thing that will fulfill us and make us feel complete. And this is ultimately what 'The Twin' is about: becoming whole. At different stages in the book various people become the twin for Helmer. At one point it is his mother; his ally when he tries to go to college; then it is Jaap, the farmhand-friend, who teaches him how to swim and makes him feel whole again. At one point, young Helmer also becomes a surrogate twin, bringing him the physical closeness that he missed so much when his brother died. Each character, to varying degrees enables Helmer to face up to his fears and helps him to find happiness in being alone. The irony is, of course, that when he was surround by his family and friends, he felt most lonely, but as they all left and he was actually on his own, specifically at the very end of the book, he did not feel lonely any more: 'I stay sitting calmly. I am alone'. Of course, Helmer is not actually alone. He is surrounded by people who care about him, but it is only when he lets go of his grief, that he can let love in. I urge you to read this book. It is a simple story, told as much through imagery as anything else, and so reminds me in many ways of a thought-provoking poem. In a book where death can come in the form of an humble egg ( a thing usually associated with the beginning of life) and where omens are foretold by the presence of a black hooded-crow, you cannot help but be enthralled. 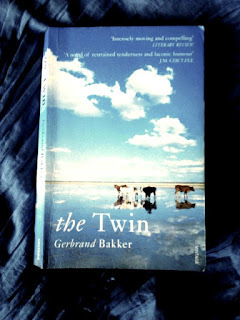 This novel may be about twins, but you will have to go a long way to find another one like it, believe me. Now go read it!